John Evans was born on the mainland, and relocated to the Big Island after spending three years studying Chemical Engineering at the University of Nevada, Reno. In 2009, he enrolled at Hawai‘i Community College, where he obtained his Associate of Science in Information Technology two years later. 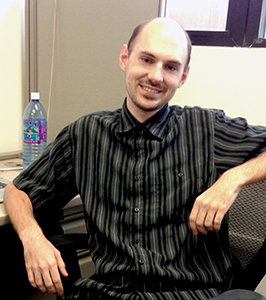 John is currently pursuing his bachelor’s degree in Computer Science at UH Hilo, and will graduate in Spring 2015. After completing his degree, John plans to pursue employment in industry working on big data solutions, and would prefer to stay within the islands. In his spare time, John enjoys practicing the martial arts, working on personal programming projects, reading, writing books, and spear fishing. Project Abstract: Electronic health records offer many advantages, including reductions in cost and inaccuracies associated with paper-based systems. Makani Kai Tech has a client that relies on paper records for vendor certification of pharmaceutical supplies, and the client has requested the construction of a secure Web portal to be used by internal product managers and customer suppliers. The portal is broken down into four components, each comprised of smaller subcomponents: Layer 1 is a cloud server containing the Web portal’s database, along with the Application Programming Interface (API) for interacting with the database. Layer 2 exposes Layer 1 via Representational State Transfer (RESTful). Layer 3 authenticates Layer 2, exposing the API to authorized users. Product managers log in using credentials existing within the server, while suppliers log in via a separate website using a session cookie. Before a supplier is permitted to log in, a product manager must create a contact for the supplier and send a linked email invite to opt-in to the site. Once clicked, the supplier selects a unique password and provides this, along with the email address, as means of authentication. Lastly, Layer 4 provides the user interface that allows users to interact with the previous three layers. To date, all back-end systems (i.e., database, RESTful API, and user authentication) have been implemented, leaving only the HTML5-based front-end. Once completed, the portal will be subjected to testing, then deployed for customer review.